It is unusually quiet in White Plains Ridgeway Elementary School in-door recess because rows of students are sitting in front of large posters trying to figure out the clues. The “Did you know” lunchroom scavenger hunt program, by We Future Cycle, is challenging students to look beyond recycling. Students learn shocking statistics about the every day things they use. They learn that the US alone uses 500 million straws per day, for an average use time of less than 60 seconds. And they learn that it is easy to make a difference. Just ask yourself ” Do I really need that straw”. Filling out blanks, unscrambling the clues brought students to ponder facts like that the world uses AND DISCARDS over a trillion plastic bags a year. Each of these plastic bags still being in existence, most ending up floating in our water ways now. Students learned about the staggering mountains of single use plastic bottles in the US and the depressing recycling rate of only 23%. 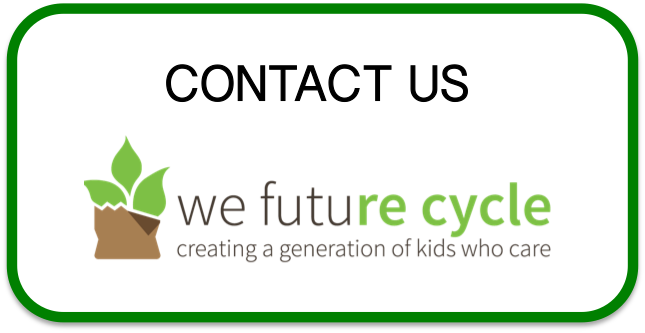 We Future Cycle’s goal is to nurture the other two Rs , REDUCE and REUSE in participating schools. Society cannot recycle itself to zero waste and only through education we can change our throw-away society. Meet the new “friends” of Ridgeway’s Ms. Vendola’s second grade. Eager students learned all about the wonders of worm composting, or technically called Vermiculture. We Future Cycle Executive Director Anna Giordano brought her composting friends to share with the students. Primed and prepared by Ms. Vendola, Students learned in a presentation about how worms eat, breathe, live and of course….poop. The worm casting is what makes vermiculture so desirable, talking about fertilizer on steroids! After learning about it, students got to check things out for themselves. On wet paper towels, in a darkened room, each student, armed and dangerous with a magnifying glass looked for baby worms and cocoons. They learned how worms can move and checked out the bristles on the underside (yes, worms have an underside) of the worm that helps them to move. And then we built their very own worm bin and some of Anna Giordano’s “friends” have a new home now at White Plains Ridgeway Elementary School. Students will do scientific observations as to what foods are preferred by the worms, how long it takes for an apple core to be consumed and how fast the worms multiply in a friendly environment. A fascinating, hands-on experience for the students. On April 23rd, just in time for Earth day, Westchester’s Material Recovery Facility added milk cartons to their list of recyclable materials. They are actually taking not only milk cartons which are called by the industry “gable tops” a paper product container with a PET lining, but also “aseptics” which is a paper container with an aluminum foil and PET liner. A typical Westchester Elementary school is generating around 500 cartons per day. A mix of cable tops (milk cartons) and aseptics (like juice boxes). We Future Cycle has been instrumental pushing for Westchester to join the surrounding counties accepting this material. The We Future Cycle recycling program includes sorting the milk cartons from day one. If the material was recycled depended how the school had their waste removal organized. There are three systems of waste removal within Westchester school districts. c: The district has their own employees pick up the waste and feed into their municipal system. White Plains, New Rochelle and Mamaroneck are feeding into the Westchester MRF and are all We Future Cycle schools. They are excited to be able to finally have the cartons included with commingled. White Plains has even made adjustments to their pick up schedule to accommodate for the increased recycling amounts as well as the drastically reduced trash. Before implementing the We Future Cycle recycling program, White Plains DPW picked up trash every day, but now with the drastically reduced waste, and the increased amount of recycling, the schedule was adjusted to twice per week recycling pick up and a reduction down to only 2 or 3 times per week garbage pick up. Commercial carters do not feed their materials into the Westchester County Material Recovery Facility across from Stew Leonard’s, they use the commercial single stream facilities in the area. The schools using commercial carters have been able to recycle their cartons from day one.